I would like to share with you this fabulous DIY project by Lucy on her blog Attic24. If you love crocheting like me, you are going to love this beautiful and colorful crochet layered flowers. And they come with the leaves, which make them look so vivid! 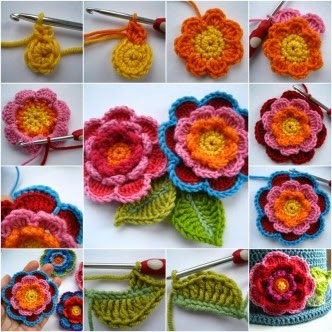 As with other fabric flowers, you can use these beautiful crochet flowers as ornaments for a lot of things, such as bags, hats, cushions, brooch, crochet shoes, clothes and so on. Thanks Lucy for the wonderful work and detailed instructions! Εάν σας αρέσει να πλέκετε όπως και εμένα, θα αγαπήσετε αυτά τα πανέμορφα λουλούδια με τα φύλλα. Posted by Σαμάνθα at 9:28 π.μ.